Has the popularity of the pond/stream/waterfall run its course? I used to build and install several of these a year, but in recent years interest has dropped off. Not quite sure why, maybe it’s mostly related to the fact that they’re completely in the category of want, versus need, and most people are staying closer to the need end of the spectrum these days. 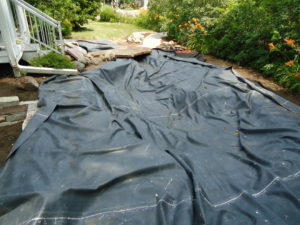 After installing ponds and water features for almost 20 years now I’ve seen quite an evolution to the whole industry. When I started installing them, it was with the impetus of a company called “Aquascapes” behind me. I used their hardware, and their techniques. They were very successful in marketing both, reaching out to landscape contractors in ways that were unique. I moved on from Aquascapes hardware a number of years ago, developing my own, budget friendly approach to building water features. 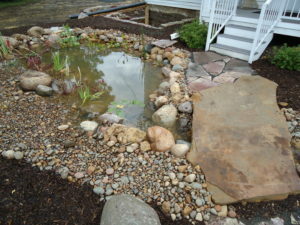 I also moved away from building ponds, though not completely. Most people want the sound and visuals that a stream and waterfall offer, not caring so much about the pond itself. 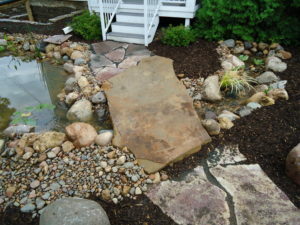 I can build a heck of a stream or waterfall with minimal hardware, bringing down the cost, and customize it with a variety of stone options. This increases the dramatic effect while, again, reducing the cost, allowing the homeowner to spend money saved in hardware costs on things like large pieces of dramatic-looking pieces of ledge-stone, for example. In years past I’ve built streams that cascade down alongside the main walk/steps into someone’s home. The dramatic effect is impressive, both audible and visual as you walk to the front door. I have a stream flowing under a large flat stone that creates a step in my own front entrance. Moving, flowing water makes a statement like nothing else; why not consider it?